On the morning of November 16, 2010 William and Kate ended months of speculation by finally, officially announcing their engagement. Kate wore a stunning blue Issa long sleeved wrap dress to go with the new-to-her blue sapphire and diamond heirloom engagement ring. She also wore a blue gemstone and diamond earring and necklace set. This is most of the world's first image of Kate, and what an iconic image it was. I personally think she hit it out of the ball park. She's never looked better, her hair was fantastic and never looked better, and everything about the outfit was just great. I am particularly admired here of her choice in jewelry. It is so dainty and subtle that at first glance I didn't even really notice the necklace, much less the matching earring set (I blame the way she likes to wear her hair, which tends to overshadow her neckline.) But upon closer inspection I find it definitely has a wow factor. It was understated enough so as not to take attention away from "the ring" - as if that was possible! - and stay on color theme but also subtly adding a bit of extra sparkle and just hint at the low neckline. The stone lands squarely in the hollow of her clavicle and the dress is low cut, but she still managed to come across as classy and elegant. And I find it interesting that this was not the "debut" of the necklace and earrings set, both jewelry and dress were items she owned for years prior so you gotta love that the girl can bust out some oldies from her closet and rock it the same as she would a new outfit. The necklace is part of the Elsa Peretti "Color by the Yard" collection from Tiffany & Co. jewelry. 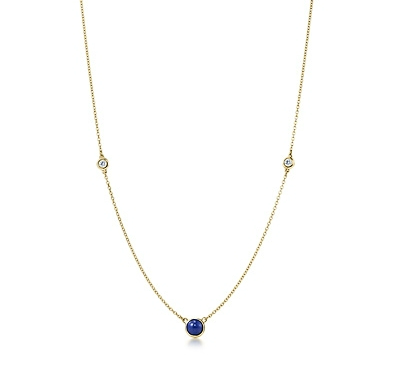 It consists of a solitaire cabochon lapis lazuli gemstone flanked by two brilliant cut diamonds in 18K gold 18" link. Cabochon refers to a type of stone that is not cut into facets but rather smoothed into a rounded dome. While Kate's necklace photographs as looking more oblong or oval, this is just due to the placement of the round stone against her neckline. Some Kate websites have ID'd the center stone of her necklace as being a sapphire, while the Tiffany listing describes a lapis gemstone. I'm going to have to go with the Tiffany description and say that Kate's version is the original lapis gemstone as well since it is clearly the same item. A sapphire is a more precious gemstone than lapis and would be faceted to bring out the brilliance of the stone. So Kate mixed gemstones but it worked out for the best. Kate also wears the matching earring set consisting of diamond studs with a cabochon lapis lazuli drop, both of which match the stones and cuts on the necklace. However the only matching earrings available on the Tiffany website are lapis studs. This necklace retails for approximately $1,150 USD. 18K gold with lapis lazuli cabochon and two brilliant cut diamonds. What I was looking for in repliKates was something equally dainty in a similar color theme and similar stone/link placement. And of course it would not be an affordable replica if it didn't sub in imitation stones for the real deal! 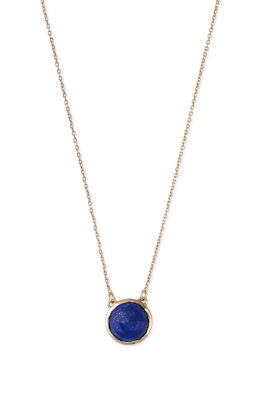 This first one is by Stella & Dot, a solitaire bezeled lapis lazuli ("bezeled" means the gemstone has facets cut into it to catch the light) on a gold tone link. It lacks the extra diamonds but it is a very affordable and on theme look-a-like. 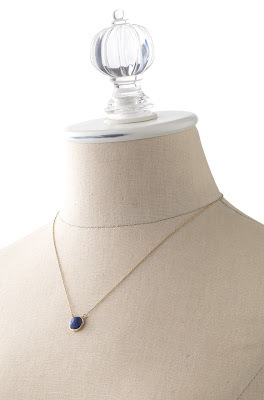 Stella & Dot - stone solitaire pendant necklace in navy. Hand-cut bezel lapis, plated gold. 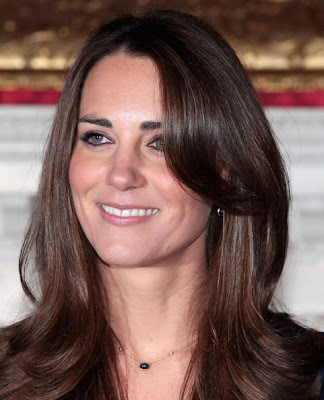 Here is a side angle of the same necklace and you can see it has just about the same placement as Kate's. It is 16" in length with a 2" extender. While it is missing a bit of the extra sparkle of Kate's original, I think it's a perfectly spot on look-a-like. This piece retails for approximately $39 USD. 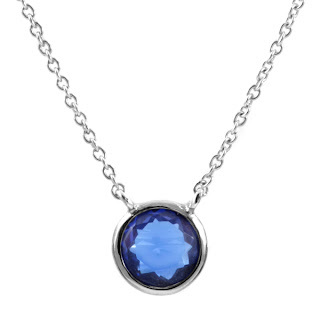 This necklace from Emitations is another good contender, with a single faceted false sapphire on a silver tone adjustable link from 16" to 18" in length. I think this look-a-like mimics the daintiness and subtly of Kate's version. This necklace retails for approximately $35 USD. If you are further interested, Emitatons has a line cheekily called "CZs by the Yard" which features necklaces with a solitaire center stone and two side stones (all falsies of course). Emitations - Jessica's faux sapphire necklace. Sterling silver and cubic zirconia bezel sapphire. 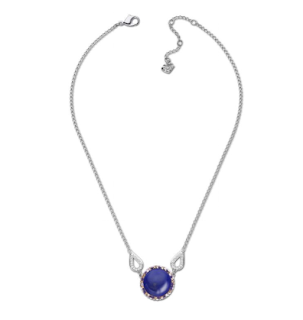 This version by Swarovski features their high quality crystal solitaire made to resemble the laps lazuli gemstone in a smoothed cabochon style. This stone is framed in a colored crystal pavé setting and flanked by two crystal pavé teardrops. The link is 14 7/8" in length. I think this is look-a-like is the one that is most in the style of Kate's with just a little variation. This necklace retails for approximately $80 USD. Lapis lazuli colored acrylic glass, crystal, and rhodium plated. 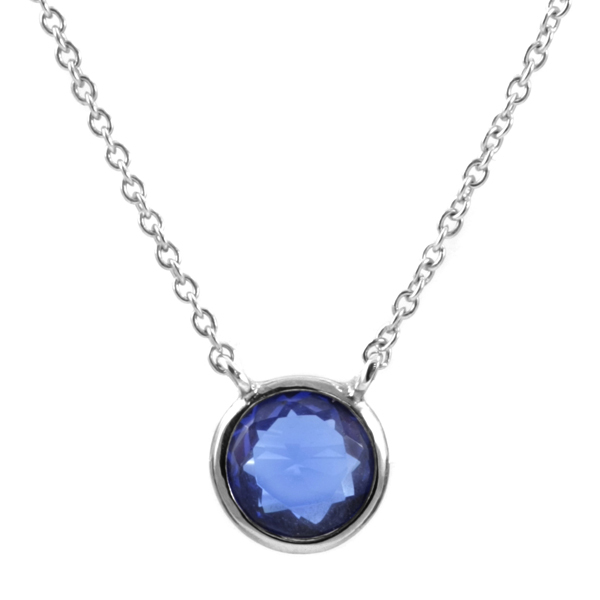 Another Swarovski version features a faceted solitaire crystal made to look like sapphire in a frame of pavé crystals. It measures 15 5/8" in length. 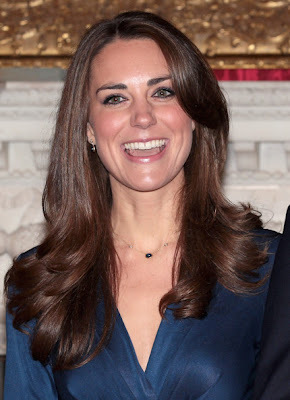 I think the use of blue and clear stones mimics Kate's color theme, even if the overall look is a bit removed. This necklace retails for approximately $85 USD. 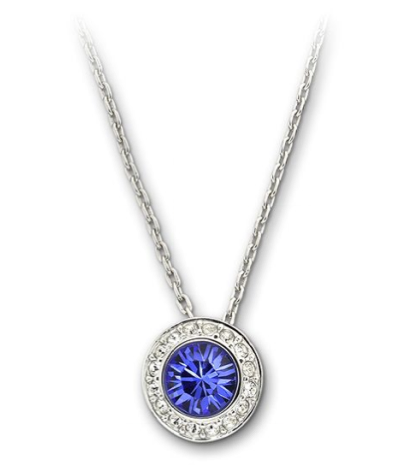 Swarovski - "Angelic" sapphire pendant.